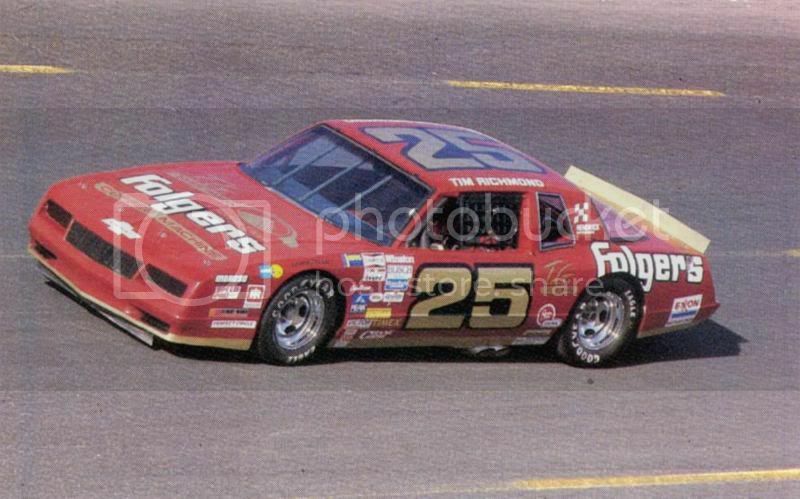 The late Tim Richmond in his 1986 Folger’s Chevy Monte Carlo is up this week. Red, gold, and white is a great color scheme. The gold reflective door numbers look really good. I wish the stripe would extend all the way around the car, except on just the front and rear. Other than that, this is a really good look. I’m also amazed at the angle of the spoiler. This was the first year the Monte Carlo had the aerocoupe rear-window design. Previously, the rear-window had been vertical, but because the Ford Thunderbird had the angled rear-window, it was much more aerodynamic. The low angle of the spoiler is meant to work around that.